The U.S. Patent and Trademark office awarded Apple with U.S. Patent 8,959,013, entitled "Virtual Keyboard for a Non-Tactile Three Dimensional User Interface." First discovered by AppleInsider, the newly granted invention describes a virtual keyboard that would allow users to type on air. The system would use a 3D capturing device, such as an array of cameras, that would detect a user's hand movements. A user would be able to type and control a virtual keyboard by moving their fingers or hands, and the system would determine which words and keystrokes a user intends to type. 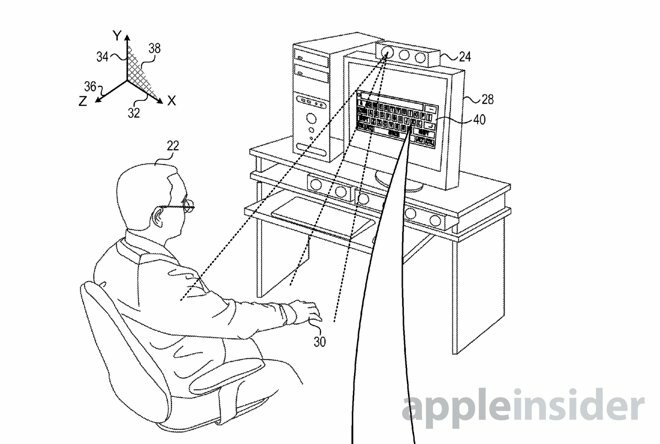 In the patent, Apple notes that its system could capture 3D information by scanning an "interactive area" located in front of a display screen. In this sense, users could interact with objects on a Mac or HDTV by using their hands in front of them, without physically touching a keyboard, remote, or touchscreen. If the concept sounds familiar, it's because PrimeSense is the same company that powered the technology behind the first generation of Microsoft's Xbox Kinect. However, even in its second generation hardware, Kinect does not allow the kind of precise gesture input described in the latest Apple patent, which was originally filed by PrimeSense in 2011. Apple's invention would feature cameras accurate enough to detect subtle fingertip movements for a virtual keyboard or otherwise. To help determine which keys a user intends to press, Apple's system would use a "language model" similar to its QuickType suggestions in iOS 8. This would provide a "best guess of the user's intended input," the filing reads, which would allow users to enter more quickly. Apple's awarded patent is credited to PrimeSense employees Micha Galor, Ofir Or, Shai Litvak, and Erez Sali. Apple's first awarded patent via the PrimeSense acquisition came last December, and it described a projection-based 3D mapping solution for advanced gesture input. PrimeSense was founded in 2005, gaining notoriety in 2010 when Microsoft licensed its infrared motion-tracking, depth-sensing chip for the Kinect accessory for Xbox 360. Apple eventually bought Primesense in 2013 at a price tag said to be between $345 million and $360 million.